Painting a door can transform an entryway just like painting a wall can transform a room. 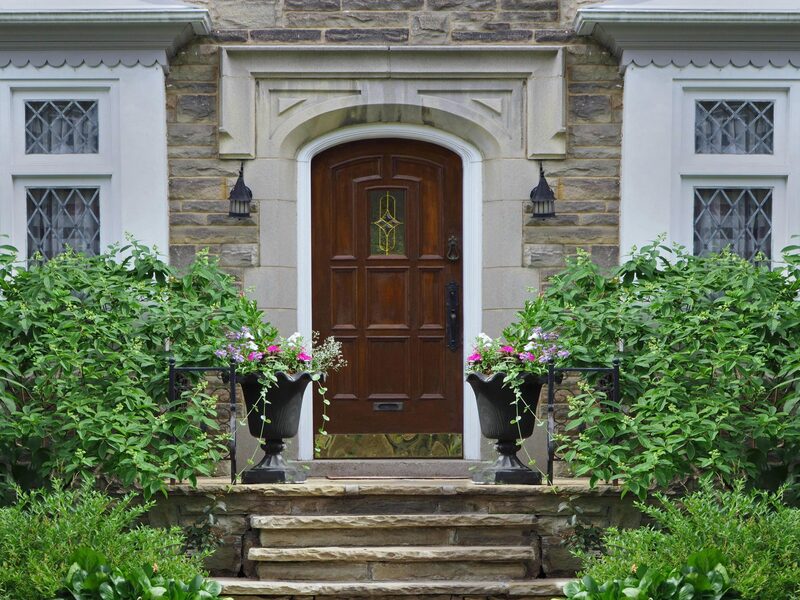 Painting your home’s front door can add curb appeal, too. But, there’s more to painting a door than you might think. Here’s how to manage the logistics of its three-dimensional shape and recessed areas to get the smoothest, best-looking finished product possible. Using a small angled brush, paint the detail areas first, making sure to get into all the tiny nooks and corners. After you’ve coated these areas, go back over them with smooth, long brush strokes. Next, remove the tape from the flat surfaces. To paint the flat areas of the door, begin with the parts that are located inside of the detail areas. For example, if you have vertical rectangles made from the recessed areas, paint the interior of those rectangles first using a small roller brush. Work your way from the middle of the door out to the edges. Catch any drips quickly or you’ll have to sand and repaint after everything is dry. Just like on walls, if you’re covering a up a dark color or painting with a significantly darker color than what’s existing, you should use a primer first or a paint that has primer in it. Since a door is three-dimensional (as opposed to a flat wall), you’ll need to paint the edges, too. If the door is different colors on the interior and exterior sides, you’ll want to paint the hinged edge the same color as the exterior. The edge that has the latch should be the same color as the interior. The top side should be painted the interior color as well. Finally, make sure the paint is entirely dry before closing the door to prevent sticking and ruining the door’s edges.